With a plethora of Thai restaurants dotting nearly every corner of the DMV area, and the number of blogs that I have written about this type of eateries, why another one on this cuisine? Simple: because this establishment has been on my radar for some time since my first visit many moons ago, and the reputation that precedes it. 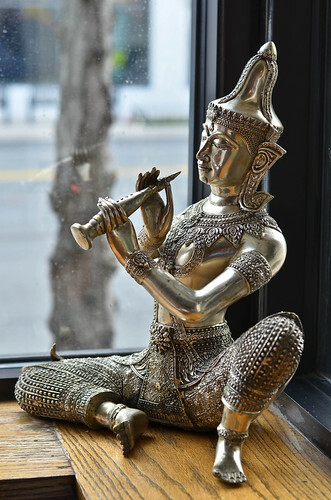 Thai Square is a small joint with only around 10 tables, located in Arlington, VA on a strip filled with other restaurants that I have written about (See Maruko and Bangkok 54). Many a times, there was a small waiting line when we arrived there, which has been a slight deterrence from visiting it more often. But we keep going back to it, taking our chances, to savor some of the dishes that make this place stand out among others. 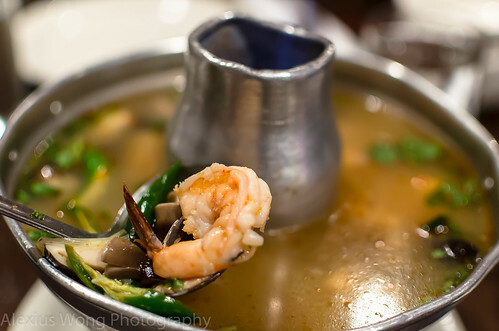 One of my favorite openers to a Thai meal is Tom Yum Goong, or Spicy Sour Shrimp Soup. This establishment serves this classic sip in a unique way. It comes in a metal pot that has a flame shooting through the middle in the opening. The Tom Yum style here is not quite like the other versions that I have savored – the broth is quite clear and devoid of the normal aromatics of lemongrass, galangal root, and Kaffir lime leaves: a Thai-Chinese style. It is rather flavorful even without the usual aromatics, quite sour from a good squeeze of lime juice, and rather piquant from the slivers of fresh green chilies that provide both spice heat and a slight vegetal fragrant note. The customary straw mushrooms adds the contrasting flavor and texture to the soup along with the pieces of mild sweet shrimp. 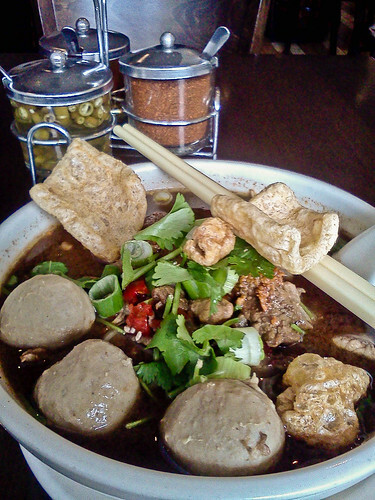 It takes some time to adjust to this style of this soup but it is worth the order. Just make sure to order it quite spicy since not-too-spicy was a bit too tame for my taste buds. This offering is one of the many traditional hot and cold appetizers that this eatery seems to handle well despite its small kitchen. Kai Pad Khing Sod is another favorite of ours. 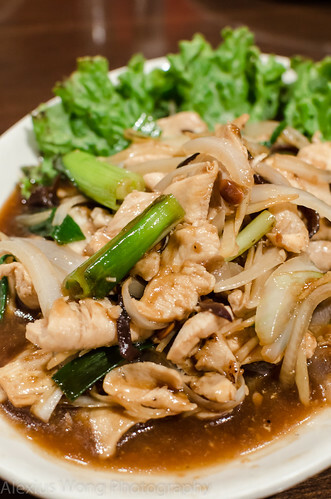 It is chicken cooked with wood fungus, ginger slices, and green onions in an oyster and bean paste sauce. The pieces of chicken are tender, the wood fungus a bit crunchy, green onions still firm but not raw, and the slices of ginger provide the bite that lifts the dish. In addition, the gravy made from both sauces is sufficiently flavorful yet complex at the same time. Brown bits of soybeans add a slight fermented salty element to the dish that adds interest to this simple dish. This is definitely a favorite of one of my dinner mates who cannot get enough of the ginger flavor that this dish packs. Here is a dish that we cannot resist: Crispy Honey Roasted Duck with Basil. Pieces of roasted duck have been battered and deep-fried, then cooked with pieces of dried chili, and flavored with honey. 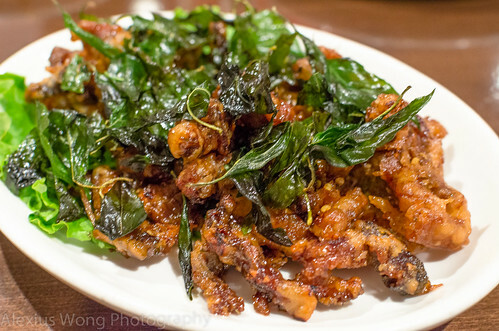 The pieces are crispy from the frying, sweet from the honey, piquant from the dried chilies, and slightly fragrant from the crispy leaves of deep-fried basil. Although we try to stay away from deep-fried dishes in most restaurants, there seems to be some kind of holy gastronomic dispensation that permits us to continuously order this dish on every visit – it is that good! This is a must order since I have not come across any other restaurant serving this delectable dish. A healthier squid version is equally highly recommended. 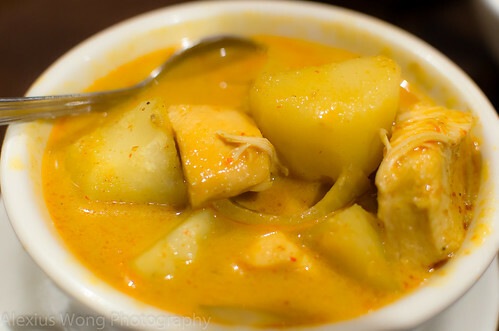 A curry dish is a must order at any Thai establishment. Since one of my dinner mates has a low tolerance for spice heat, we chose to order the Yellow Curry. It arrived in a bowl brimming with pieces of chicken breast accompanied by large pieces of potato and slivers of sweet onion. The bird meat was still moist and the tuber well cooked and permeated with the sauce flavors. Despite lacking some chili heat, the curry sauce was quite fragrant from the aromatics and spices while the coconut milk added the necessary smooth richness that tied the elements together. The other curry offerings come in the red, green, country, and Panang versions. It also serves the Roasted Duck in Red Curry Sauce that carries pieces of pineapple and basil leaves along with the aforementioned meat – I recall its spiciness along with the strong flavors of the ingredients that do a good job balancing each other out – quite a spicy treat. Another must-order here is the Lump Crab Meat Fried Rice. 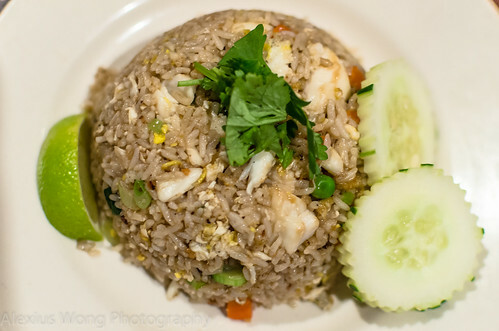 It is rice fried a la Thai with pieces of egg, green onions, sweet onions, carrots, and the star item, jumbo lump crab meat. The rice is flavored with a combination of soy sauce and the slightly seafood-tinged fish sauce that adds an amazing savoriness to this plain grain. The large pieces of crab meat are fresh, adding a moist and sweet flavor to this dish. With some good wok-searing, this dish arrives filled with a complex level of flavors that belies the ingredients’ simplicity. Normally not a huge fan of fried rice dishes, I find this version truly delicious and completely irresistible. Another seafood dish that I have ordered in the past is Sukiyaki. Yes, it is a Japanese dish but it has been adapted to the Thai palate. The dish consists of pieces of shrimp, scallop, squid, chicken that have been stir-fried with bean thread noodles, Napa cabbage, celery and scallions, served with a slightly sweet and spicy sauce. This dish tastes far from the Japanese version with its level of savoriness that spells clearly Thai. Furthermore, the sauce adds the sweet and spicy notes to the dish. Yes, sweetness is an important and integral flavor element in Thai cuisine. 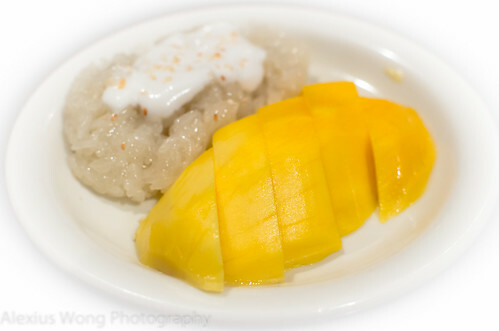 For dessert, we elected for the true and tested that would hardly disappoint the diner – Mango and Sticky Rice. Since it was the middle of summer, it was the perfect order for the pieces of mango were ripe and sweet. Such fruitiness was paired up and complemented by the rich coconut-laced steamed sticky rice that was further enriched by more salty coconut cream, punctuated by pieces of fragrant sesame seeds. How can you go wrong with this classic Thai combination? On other visits to this locale, we have ordered a sweet stew of Taro root, Yam, and Tapioca Pearls, coated by a coconut cream sauce and sweetened by palm sugar. These dessert dishes are not listed on the menu since they must be seasonal and offered occasionally. Make sure to leave some room for these sweet treats at the end of the meal. Thai Square is a quaint little eatery that attracts as many Thai customers as the farang, non-Thai. In the many years that I have visited it, I have hardly walked away disappointed but always glad that I took the chance on a quiet night or was patient enough to brave the lines and wait for one of the few tables to clear up. No matter the circumstance, I have always left with a sated stomach and wide smile, vowing to return in the near future. With the really modest prices and wonderfully authentic skilful cooking, there are no excuses not to make the journey, wait in line, and fill the senses with satisfying Thai flavors found in the long listed menu. You’ll know what I mean when you make it there one day. Addendum: Upon the recommendation of my Thai doctor, I stopped by Thai Square to sample a lunch dish that is not served anywhere else which carries quite a reputation among the cognoscenti – Boat Market Beef Noodle Soup. The large bowl arrived with a mound of rice noodles inundated in a dark rich fragrant beef broth scented with some cinnamon and star anise. The large beef balls were floating like buoys, alongside bits of tender beef, all made fragrant by some fried garlic and fresh cilantro and green onions. Bits of pork crackling added to the lusciousness of this dish. Digging into it, I was transported to the boat markets of Thailand imagining this bowl handed to me by a cook from her floating vessel. It was the perfect noodle soup dish on a cold wet day. My doctor was delighted to receive a take-out order from me during my visit after. This is a must-order during the lunch hours. I can taste and smell the food the way you described the dishes. You know how partial Mummy and I are to Thai food! Well done.